The motorcycle Luggage industry is saturated with low quality saddlebags and products that don't last. Don't get tricked into purchasing anything less than premium saddlebags for your Triumph motorcycle. 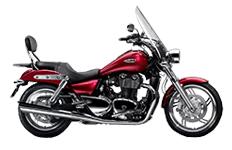 Choose from our huge selection of saddlebags for your triumph, we have many variations for almost every model. Our bags will fit your specific storage and traveling needs. Don't worry about the mounting hardware, it's included free with every saddlebag purchase. Live in an area where theres heavy rain? Our R&D department already took care of that, we test to make sure our saddlebags are 100% waterproof. 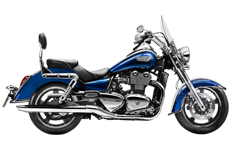 Viking Bags are more resilient and attractively designed than competitor bags, and the Triumph saddlebag lineup is specifically tailored for every type of rider. 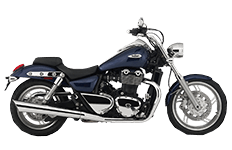 We feature a full catalog of saddlebags and other luggage compartments made for your Triumph. Take a look inside of our online store and feel free to contact us with any questions you may have. Of course, we'll help you out in any way we can. 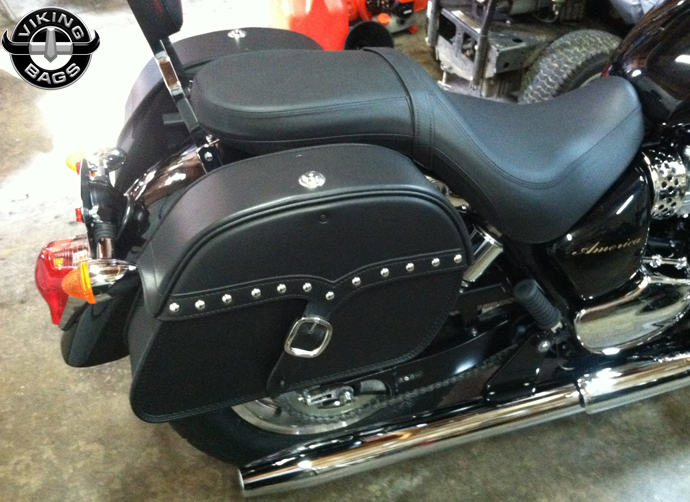 Viking Triumph Saddlebags are made with a hard shell that will guarantee shape retention. 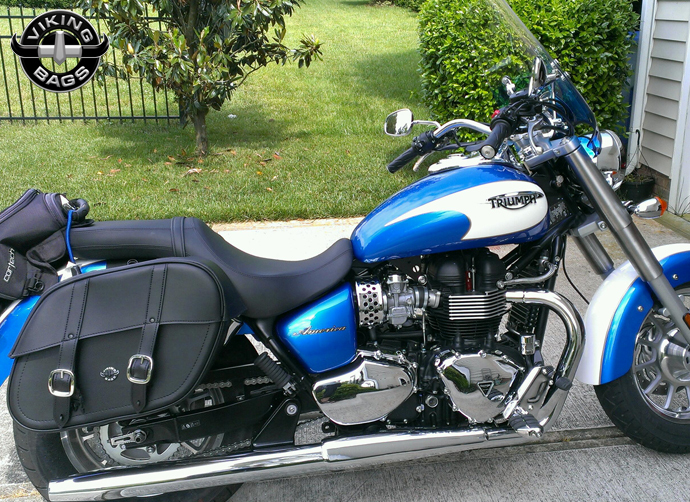 Our Triumph saddle bags are made of durable synthetic leather and are easy to clean in any weather environment. Each set of Viking Triumph bags include a free set of hard mount brackets. These Triumph saddle bags are perfect for long trips. We are so confident about our products that we offer a 30 day money back guarantee with every single item on our website. Best of all we offer a variety of styles and designs that met everyone's taste of style. Take a look at our shock cut out Viking Saddlebags for Triumph Motorcycles. 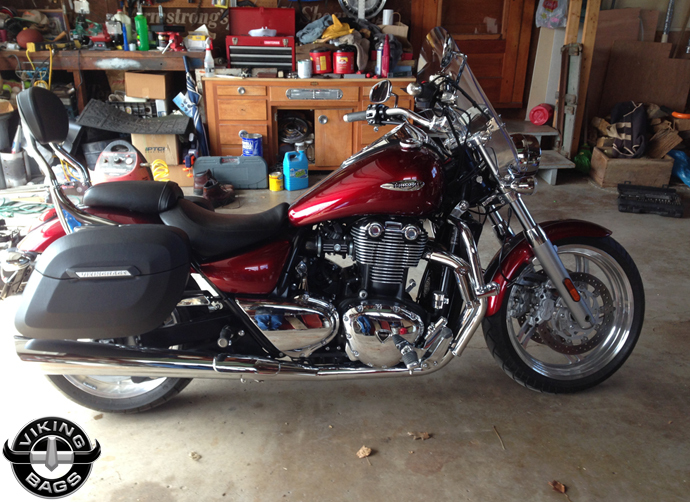 They fit incredibly close to the shock leaving zero inches between the bike and Viking saddlebags. 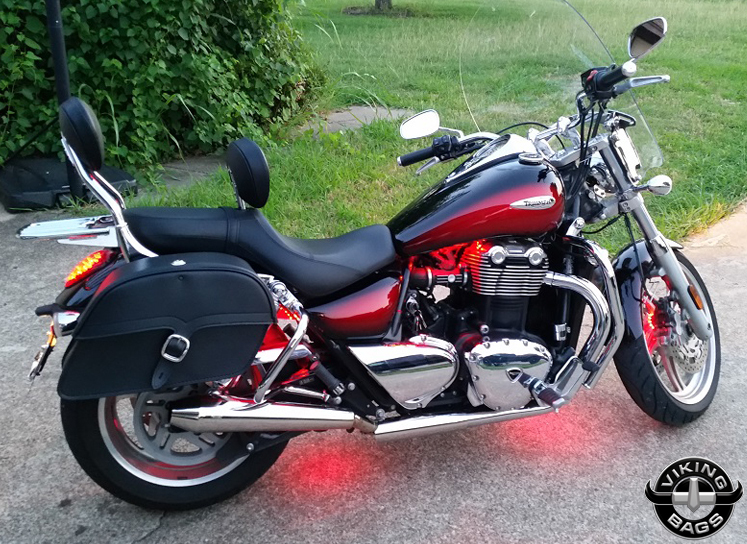 There are ways that riders can choose their next pair of saddlebags, and understanding how to select your next pair will make the process that much easier. 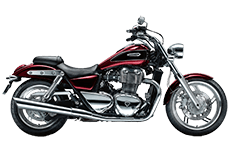 Triumph has a wide range of saddlebags to suit every make and model of motorcycles, so the choice in selection comes when you know how each of these Triumph saddlebags can better serve you. 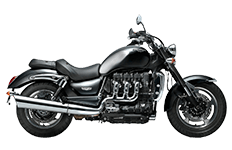 The various series of Triumph saddlebags include Triumph America, Triumph Rocket III Roadster, Triumph Rocket III Touring, Triumph Speedmaster, Triumph Thunderbird, Triumph Thunderbird 1700 Big Bore and Triumph Thunderbird SE. If you own one or more of these Triumph motorcycles, you'll be happy to know that many of these bags are universally designed to mount on multiple models. Customers who have purchase a Triumph Motorcycle luggage bag will receive a free set of mounting hardware. 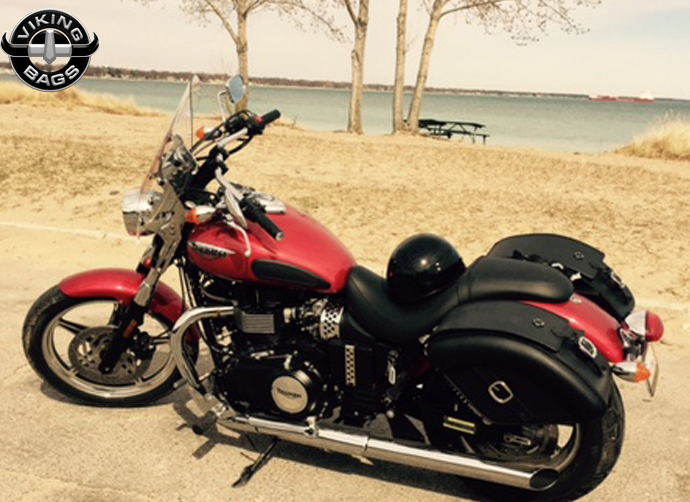 So let's ask yourself a series of questions to ensure a proper match with a Viking Triumph saddlebag. For starters, what shape and size do you need for your daily travels? Depending on the structure of your motorcycle and your tastes and requirements you can choose from different shapes. 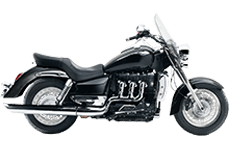 Our Viking lineup of Triumph bags comes in various designs, such as slanted, quarter circle, concord, etc. Likewise, riders can choose between small, medium and large sizes, so no matter how much or how little they need hauled, Viking has it all. 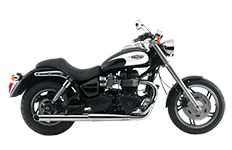 If your bike has external shocks to ensure that saddlebag fits well, buy Triumph saddlebags with shock cut outs. Secondly, what kind of goods do you intend to carry in your Triumph bags? If you intend to carry too many things, make sure you buy Triumph saddlebags with multiple compartments so that it’s easy to find everything. Now valuable items or important documents can be kept safe in saddlebags which have built-in locking systems. For storing voluminous items like full face helmets, a spacious medium to large Triumph saddlebag suits best. How often will you be riding? From daily commutes to long-distance rides, it is advisable to have weather resistant saddlebags with heavy duty fiberglass body and metal frame that ensures it retains its shape. 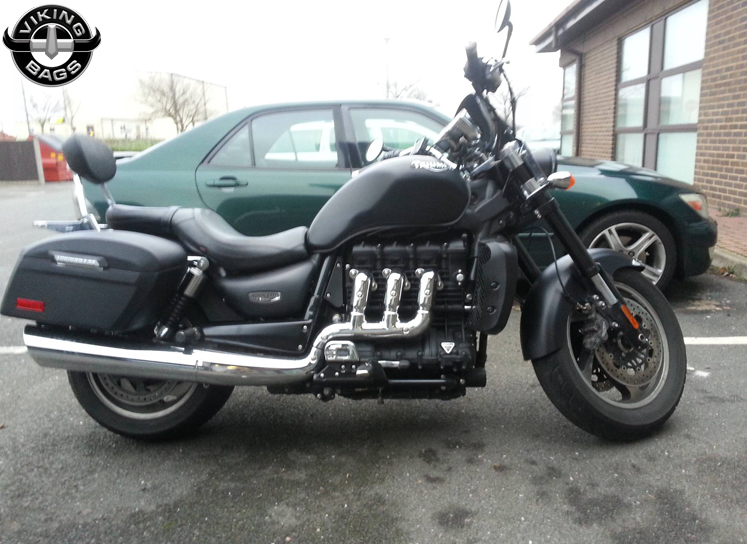 You can find such saddlebags in the Triumph Rocket III Touring series. 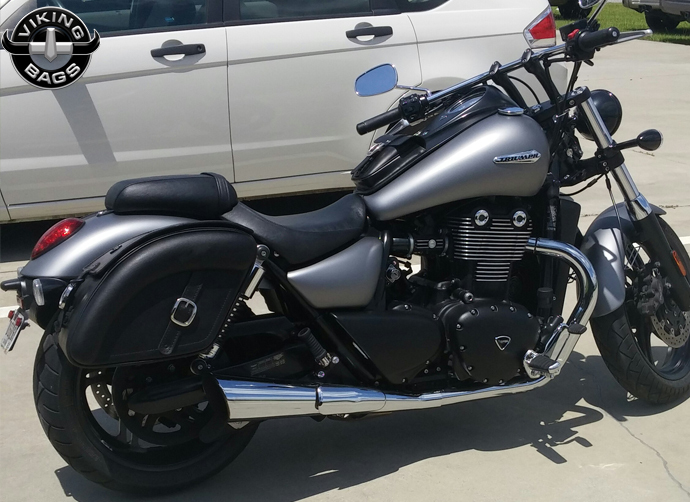 How do you want to attach/mount your saddlebags to your Triumph? Most saddlebags for Triumph come with free mounting gear to help you hard mount them, but all of them can be used as throw over saddlebags too. A quick disconnect system can also be used if multiple saddlebags will be attached to your motorcycle, serving the many different purposes you may have for them. 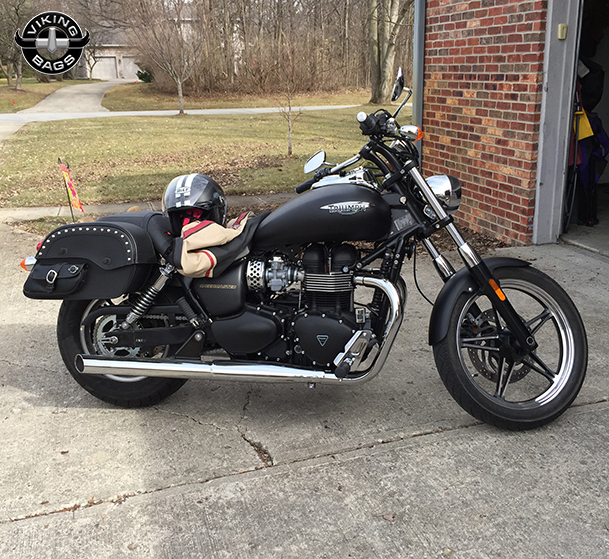 We try to make sure that all of your Viking Bags needs are met here, so we offer you a variety of different ways to install your saddlebags. 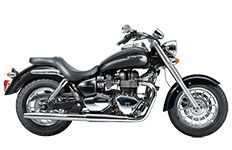 We make it easy and convenient to use our online system to order, and browsing through each Triumph saddlebag product gives you the ability to compare the specs on each model. We also offer a 30-day money back guarantee on all of our products to ensure your satisfaction when buying, because sometimes ordering the right products online can be quite tricky. If you need to return or exchange a product, we'll be happy to make that an easier task within this 30 day grace period. We'll even help you pick out the saddlebag replacement pair, because we're committed to your satisfaction!